Gordian was the first to strike the reverse design of Moesia standing between a Bull and Lion (some with variations). The city of Viminacium, established in 239 A.D. became a very large city in Moesia Superior as the years went on. Extensive excavations are now underway with impressive results and a long way to go. 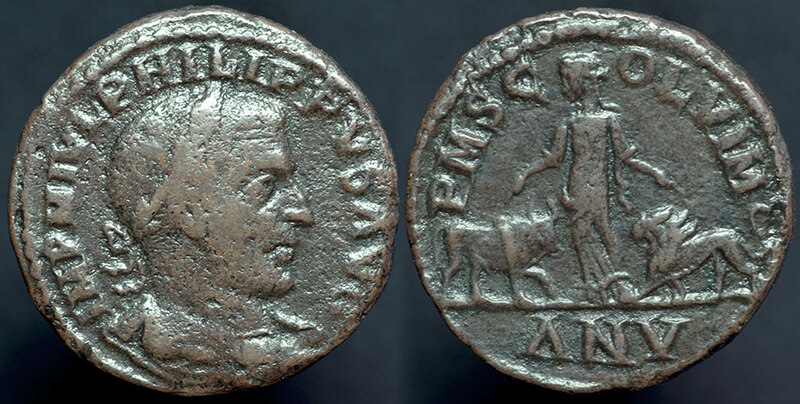 OB: IMP M IVL PHILIPPVS AVG; "Emperor Marcus Julius Philippus Augustus"
Rx: PMS C-OL VIM // AN V; Moesia standing from the front facing left, both hands extended above an bull to the left turned to the right and a lion to the right turned to the left. Legend means: 'Province Mœsia Superior Colonia Viminacium // Anno septimus', (Colony of Viminacium province of Upper Moesia // Year 5). Viminacium was founded by Gordian III in 239 or 240 (Year I). On the reverse, the Province or Tyche of the city is placed between the emblems of the Legions VII (Bull) and IV (Lion). Philip was born in Bostra in Trachonitis, province of Arabia, hence the nickname of the emperor. He is appointed prefect of the Praetorium after the death of Timésithée, the father-in-law of Gordian III, in 243. Philip makes or lets Gordian murder early in 244 and then hastens to conclude an infamous peace with the Sassanids. He pays them a tribute of 500,000 deniers. He named his son Philip Caesar in 244 and his wife Otacilia Severa augusta. In 247, Philip raises his son to augustat. He led a brilliant campaign against the Quades and Carpi who had invaded Dacia. The great event of Philip's reign is the commemoration of the millennium of Rome which begins on April 21, 247. Several usurpers, including Jotapian and Pacatian, proclaim themselves august at the end of the reign. Philippe charges Decius, commander of the Pannonian legions, to restore order on the Danube. The troops, against his will, proclaim Decius Augustus in June or July 249. Philip died fighting the troops of Decius in September 249. AE 29 (mm) Sestertius; struck ~ 245 A.D.